Footloose has become an iconic 1980s classic tale alongside the likes of Dirty Dancing and Top Gun, while it's 2011 movie remake has also cemented it as a firm favourite for another generation. Now the musical theatre version of this tale about rebellion and romance among the teenagers in Bible-belt America - where dancing is banned - is back on a UK tour. Country dancing and guitars galore in Footloose at New Alexandra Theatre. Stopping off at Birmingham's New Alexandra Theatre for a week from July 4 to 9, the show was supposed to feature ex-Pop Idol singer Gareth Gates, but he had to pull out from the whole week's performances due to a vocal injury. 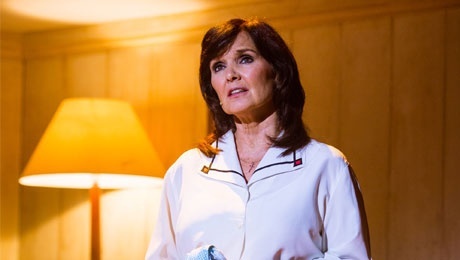 It left Maureen Nolan of The Nolans fame as the only well-known face in its supporting cast as preacher's wife Vi Moore. It didn't matter too much as Footloose isn't so much about the celebrity faces as the music. You probably won't have got through a week without hearing songs from the show on local radio. Songs like Holding Out For A Hero, Let's Hear It For The Boy and Almost Paradise. The story revolves around Chicago teenage city boy Ren who is forced to move with his mum to the backwater town of Bomont. Things only get worse when he realises that dancing is banned. But fighting against the establishment with his new best friend Willard and the preacher's rebellious daughter Ariel, Ren sets about bringing dance back to Bomont. I'm not sure if the cast was thrown into some disarray at missing Gareth Gates as Willard, but most of the opening half of the show was slow and stuttered to get going. It laboured over some of the conversations and needed to have much more energy and pace. The singing was good but the musical lacked big, impressive group dance routines and relied on the individual talents of impressive Luke Baker, in the lead role, playing the part made famous by Kevin Bacon in the original movie. Baker is an excellent dancer and has an air of the bad boy about him too. Some hope came in the final number before the interval with Heaven Help Me/I'm Free when most of the young cast joined together for a lively action-packed section. Thankfully, the second act continued in the same vein and brought much more zest to the stage. Maureen Nolan from The Nolans puts her voice to good use in the supporting cast. The act opened in a country music bar where Cowboy Bob sings how he's Still Rockin' and Willard is encouraged to learn how to dance to the uplifting soundtrack of Let's Hear It For The Boy - sang beautifully by Joanna Sawyer, playing Rusty. It was only matched by a moving duet between Ren and Ariel (Luke Baker and Hannah Price) of Almost Paradise towards the end of the show. Although based on the storyline of the film, this musical version does have extra more melancholy songs sung by the preacher and his wife that slow down the pace. Most of the cast also play all the instruments on stage, which seems to be the rage at the moment. Footloose is enjoyable enough but this production fell short of slicker, faster paced musicals around at the moment that feature almighty dance routines. Despite some impressive individual talent, it seemed to me as though this show is in need of a refresh. Tickets cost from £17.90 to £45.90 by calling call 0844 871 3011 or visiting the theatre website. 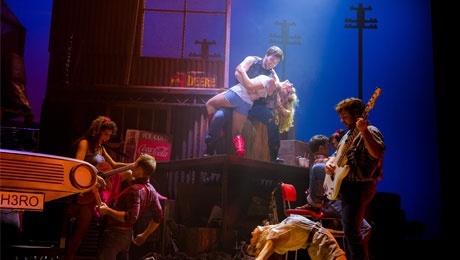 For information on the rest of the UK Tour, see the Footloose tour preview.